Developers and partners play an important role in the ecosystem of geospatial app development for Esri. They take Esri technology, customize it, and create apps for colleagues and customers. During the Esri Developer Summit, they get to talk—developer to developer—with Esri staff. They ask questions, offer feedback, and try and get a good sense of where Esri technology is heading next. Read the article. Jennifer Bell from Esri talks about publishing vector tile layers in ArcGIS Pro during an Esri Developer Summit presentation. In this smart mapping tip, learn how to represent two separate attributes on a map by using symbol size and color. This technique, demonstrated by Esri product engineer Lisa Berry, can unveil hidden relationships and patterns that you may not have found otherwise. Read the tip. Residents of Brooklyn Park, Minnesota, can use a mapping app to locate a park they want to adopt and submit an application form. It takes just minutes. Read the article. The clock is ticking, but there's still time to submit entries to the Esri Storytelling with Maps Contest. The grand prize: a drone and a one-year Drone2Map for ArcGIS license for one user. Read the article and enter the contest. Learn ArcGIS will go on the road this summer. You can take a lesson or just ask a question at the Learn ArcGIS booth, which will be open all week at the Esri User Conference (Esri UC). Read the article. IGas Energy, a gas producer in the United Kingdom, uses ArcGIS to help manage its business assets and create applications. "[Users] see it as just like looking at Google and being able to get what they need when they need it in a very easy and intuitive manner," said Chris Holly, head of IT, IGas Energy. Hear the company's story. Esri's Andrew Turner offers an overview of how bots built on platforms such as Amazon Alexa, Facebook Messenger, Slack, and Twitter, can be used to query GIS services and get answers to simple questions. Watch the video. Design your personal Esri UC schedule by using the online agenda from Esri. Full descriptions of the technical and moderated sessions are now available. Get the agenda. Want to display your GIS maps in the Esri Map Gallery at the Esri User Conference? Show thousands of people the results of your hard work. Map Gallery submissions are due June 2, 2017. Submit your map. A new aspect-slope raster function, which you can download from Esri's GitHub repository, makes it easier and faster to create an aspect-slope map from raster elevation data. Learn more. Since Esri Story Maps apps are open source, you can go to GitHub and download the code for any app and host the app on your organization's own server. Read the how-to article. Esri is hosting a series of webinars on Military Tools for ArcGIS. Topics covered include coordinate conversion and linear and radial line-of-sight analysis. Watch the webinars. 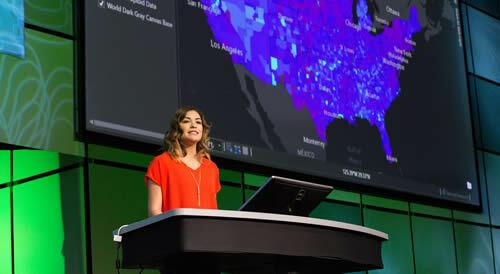 Based on conversations and feedback at the Esri Developer Summit, here are the answers to 10 questions about building apps using AppStudio for ArcGIS. Read the blog. Businesses can find hidden intelligence in data. To learn how, use Esri's Discover Local Insights app to search by ZIP code and get a snapshot of 10 different income, consumer spending, demographic, and lifestyle trends. Try the Discover Local Insights app. Learn about Location Strategy for Business. 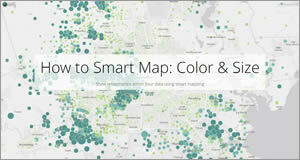 Get creative with maps using ArcGIS Maps for Adobe Creative Cloud, now in beta. You can choose from thousands of maps via Adobe Illustrator and Photoshop and then add your own design touches. Learn more and get the beta version. Esri offers US customers the ArcGIS Desktop Virtualization Dell Appliance, a virtualization solution optimized for ArcGIS Pro. Order today. Esri staff will teach you how to create 3D point clouds, 3D texture meshes, and 3D PDFs with Drone2Map for ArcGIS. The Drone2Map for ArcGIS app turns raw still imagery captured by drones into professional 2D and 3D imagery products. Sign up for the web course. Esri is continuing to help planetary scientists study planets and moons, including Mars, Mercury, Venus, Deimos, Phobos, and Europa. New capabilities are being added to the ArcGIS platform, including ArcGIS Online and ArcGIS Pro, to help investigate what's out in space. Read the blog.